What's like a sugar cookie but better? 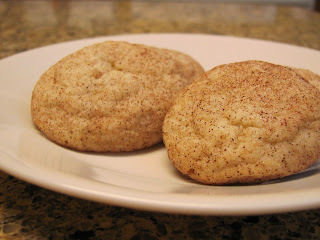 A snickerdoodle of course! Here's how I made these delectable treats. Mix the sugar and wet ingredients. 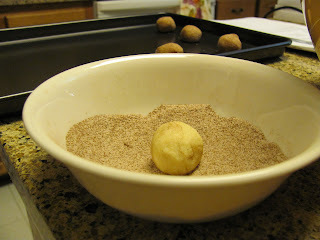 Roll dough into quarter-size balls and roll in cinnamon sugar. Place butter, shortening, 1 ½ cups sugar, eggs, and vanilla in a bowl; mix well. Add the flour, cream of tartar, baking soda, and salt. Once dough is well blended, mix together the remaining sugar and the ground cinnamon in a small bowl. Roll dough into quarter sized balls and then roll in the sugar-cinnamon mixture before placing on ungreased baking sheets. Leave plenty of space in between them because they do spread a bit. Bake for about 8 minutes, or until set. Remove immediately from baking sheets and cool on wire racks.